St James Church, Gretton. File picture. A rural bus service that served villages around Corby and Market Harborough that was due to be withdrawn this summer has been saved thanks to a successful campaign by locals. People living in Gretton, Rockingham, Cottingham, Wilbarston, and Weston-by-Welland feared they would be left stranded after a subsidy was withdrawn by Northants County Council and bus operator Centrebus said it was no longer financially viable to operate the service that took passengers to Corby and Market Harborough. Villagers joined together to campaign against the cuts, and the found out this afternoon (Friday) that a new contract would, in fact, be awarded for the service to continue with a few minor changes. “I can confirm that the times of the buses on Mondays to Fridays from Gretton, Village Hall to Corby are proposed to be at 0815, 0932, 1147, 1402 and 1600, with return journeys from Corby, George Street at 1120, 1335, 1505 / 1530 (based on CBA times) and 1745. Mr Royle said he was absolutely delighted that people power had won the day. He said: “I am so thrilled. “We don’t have any information yet as to who will be providing the service. It may well be Centrebus. But the important thing is that we will have a bus. “I wonder what would have happened if the parish council hadn’t taken the trouble to fight this. To think what might have happened. 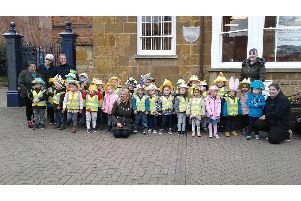 A spokesman for Northamptonshire County Council said: “The subsidy for part of the number 67 bus route, which took in the villages of Gretton and Rockingham, was removed as part of the council’s budget for 2016/17, with changes due to start at the end of the school year. “This subsidy paid for the service on Saturdays and at peak ‘commuter’ times, though the service was due to continue running commercially at off-peak times between Mondays and Fridays. “Since then, we had been made aware of plans to withdraw this commercial part of the service. “With the county council’s bus strategy aiming to keep communities connected we investigated what could be done, working with the parish councils and local councillors. “Helpfully, in this instance, because we had decided to terminate the subsidised journeys at the end of the school term, we have had some time after the start of this new financial year to consider and explore various options. “The option which has come out as the best solution is the continued operation of service 67 as a fully-subsidised conventional bus service – but run by another provider – in this instance Carter’s Travel. “The overall cost of doing this is less than the cost of the partial subsidy that was paid under the previous contract. “Additionally this also saves the county council from having to pay the extra cost of a dedicated replacement school bus service, which would have been needed if the number 67 route had been withdrawn. “Now the route is fully subsidised, rather than partially, it also represents a much better subsidy per head value.